Legendary musicians gathered early this month in Los Angeles’ Fonda Theater to celebrate and pay tribute to bass player Geezer Butler at Hartke’s Bass Player Live! Butler himself performed in several songs, and the video for “Fairies Wear Boots” has been revealed to the public. The lineup for the event consisted of a rotation on musicians, including vocalists Corey Taylor (Slipknot, Stone Sour), Doug Pinnick (King’s X) and Sebastian Bach (formerly of Skid Row,) guitarists Zakk Wylde (Black Label Society) and Chris Broderick (Megadeth,) and some of the most notable bass players in music today. 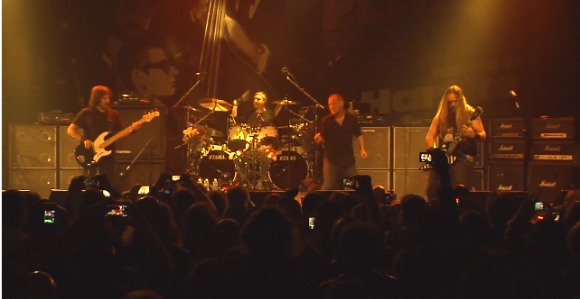 Frank Bello (Anthrax,) David Ellefson (Megadeth), Rex Brown (Pantera), Billy Sheehan (The Winery Dogs), JD DeServio (Black Label Society), Jason Newsted (formerly of Metallica) and Rudy Sarzo (Quiet Riot, Ozzy Osbourne, Dio, Whitesnake) rotated bass duties while Drummer Charlie Benante (Anthrax) alone kept the beat of the show. Butler himself played on several Black Sabbath tracks, including “N.I.B.” and the professionally recorded “Fairies Wear Boots.” Watch the video for “Fairies Wear Boots” below.